Are you in the market to have new windows installed on your screened porch? There are so many screened in porch windows and screen porch enclosure options available — how will you choose the right one? Do easy care and low maintenance sound good to you? Do you live in an area where you are able to sit outside on your screen porch for at least 9 months out of the year? Are you sick and tired of spending hours of your valuable time meticulously putting up plastic sheeting in the winter to retain heat — only to remove all of it 3 months later in the spring… and do it year-after-year? If you answered ‘yes’ to all 3 questions then Eze-Breeze vinyl windows could be the solution to your dilemma. Eze Breeze 4-track vinyl glazed windows are a great alternative to plastic sheeting for your screened porch — and it can be left in place year round. 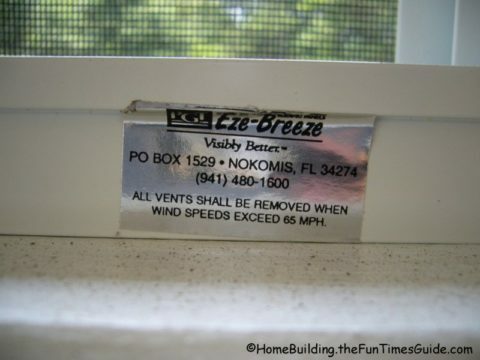 My parents had Eze Breeze windows installed in their house. They saw them advertised in the local newspaper and decided to give them a call. They had measurements taken, they were given a free estimate, and then they made the decision to have them installed. Less work around the house. They are recently retired and this was one more thing that they wanted to mark off of their To Do List for the constant upkeep of their house. They live in sunny South Carolina, so they really enjoy sitting on the screened porch passing the time, watching the multitude of birds that visit their feeders. And they especially enjoy watching storms roll through. Let me tell you, that is quite a sight to see with Mother Nature showering down all around you — without getting soaked! The alternative (plastic sheeting) looks like… well, like plastic sheeting — and it’s translucent. That kind of defeats the purpose of having a screened porch. Vinyl glazing is clear (like a window) — but costs less than glass and looks much better than plastic sheeting. Enough said. By the way, I mentioned earlier that they enjoy sitting out back watching the birds. I asked them if they have any holes in the vinyl — particularly from birds flying into the Eze Breeze windows. The answer was No. There are no holes whatsoever. As many birds visit the feeders (probably hundreds each day), they’ve seen a few fly into the windows. No punctures occurred. And better yet, the birds survived the crash with no ill effects. This is a win-win for humans and fowl alike! Yep, Eze-Breeze windows are bird-friendly. 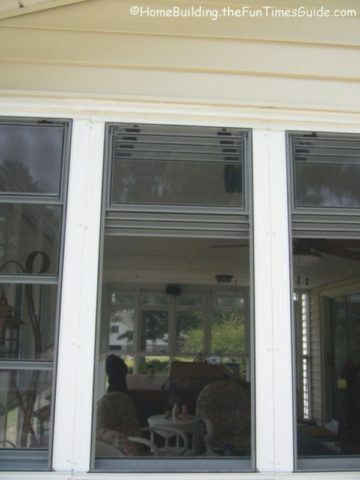 TIP: Sometimes, screened in porch windows DO fall victim to birds. Here are some ways to stop birds from flying into your windows. Eze-Breeze is a unique product because the windows are not made of glass. Instead of glass, they’re made of vinyl glazing — a glass alternative. If you gently push your fist into it, it flexes with your hand and quickly retains its shape. It looks exactly like glass from as close as an arm’s length. It’s kind of like plastic cling wrap — except that it’s tough, flexible, and thick (10 mil thick, to be exact). The manufacturer (PGT Industries) claims it is cheaper than glass. Their screen porch dimensions are approximately 11′ x 24′. There are 20 four-track windows with screens for ventilation on the top portion and 20 fully glazed windows on the bottom half. There are 2 non-Eze Breeze metal porch doors that were already in place and some small sidelight and transom windows. When the home was built many years ago, the screen porch was never really meant to be fully encased in windows — so each window is not exactly the same dimension as all the others. Therefore, a few of the windows had to be custom made on-site. It took 1 day to install it all. The total cost, including installation: $4,000. The most important factor to consider here is whether or not they are happy that they decided to have the Eze-Breeze windows installed. The answer is Yes. 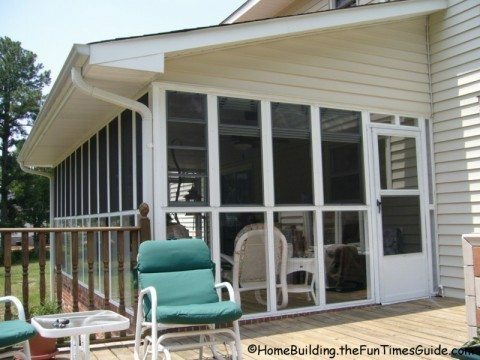 They are very happy with the way their screened in porch looks, the time and labor that Eze Breeze windows have saved them, and the quality of the installation job. You can’t ask for anything more than that! 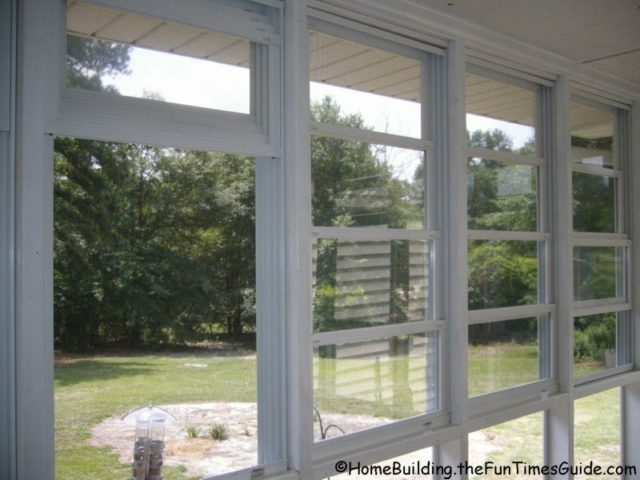 For the DIYers, here’s a little about installing Eze Breeze Windows yourself. Unfortunately, an F2 tornado rolled through my parent’s neck of the woods not long ago. The good news is that nobody was hurt. How did the Eze Breeze windows fare? Like nothing ever happened! 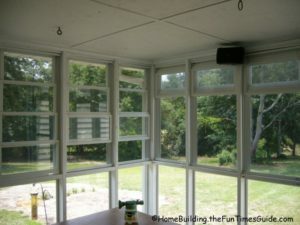 These screened in porch windows stood up to the winds and were no worse for the wear. There were trees and limbs down all around them — but the Eze Breeze windows made it through unscathed. Perhaps because the windows were on the back side of the house when the tornado rolled through helped it out, but the windows have stickers on them that say to remove them if winds of 60+ mph are expected. Screen porch enclosures are all the rage. They’re popular for many reasons. TIP: If you happen to live in a hurricane-prone area, then you need to know about impact resistant windows.